Everybody loves a good gallery wall. They are a great way to showcase art or items that may not look good solo on the wall because of their size or scale. A gallery wall is a collection of art, items, photographs, you name it - that are cohesively gathered on one wall/area of a wall. Halls and stairways are wonderful places for gallery walls because they give you an automatic frame for your gallery and also are conducive for guiding you through the display. My main rule when putting together a gallery wall? Don't space things evenly and test things before you hit the nail with the hammer. Another little trick? Use 1 inch wire nails wherever possible - they leave a very small hole. Of course, some items may require something a little sturdier. Gallery walls work for everyone and every style. Since our entire home is "gathered," or in other words, it is a collection of items rather than a "set," the idea of telling a story with our stuff flows with our whole vibe. For people with a more minimalist style, a gallery wall is even more useful because you can contain the "eclecticness" of random items in areas. The stairway gallery wall that I put together this weekend began with just the light fixture, the baroque mirrors, wedding vows that I wrote out for display and the empty frames. I decided that I wanted to fill the wall in to make it more of a gallery wall so I painted the G & L wood signs and added them. 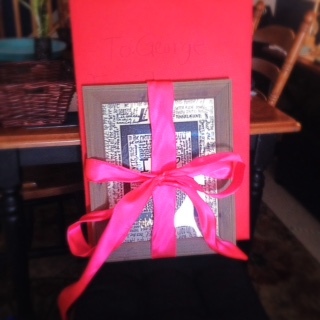 I purchased the black baroque frame and added some word art - "We fell in love right away. In love we will forever stay." I hung our cast iron dutch oven campfire rod to add some vertical interest. I placed a couple of fresh fall sprigs across the light fixture and two mini white pumpkins atop the little candelabras to add a dimensional element and finish off the space. The light fixture is an actual working fixture but is not connected to electricity at the moment. It was the first item that George and I bought together when we made updates to our first home together and we brought it with us when we moved here. Some really simple additions that tell a little bit of our story, represent us and also flow with our style and up the stairway. Since our stairway is visible from our downstairs living space, it is nice to showcase this bit of gallery in its own area while still being seen while we are downstairs. If you like how our stairway gallery looks, consider creating your own somewhere in your own home. Don't be afraid to experiment with different items or to create your own pieces. As always, thank you for stopping by. And remember, you can follow me on Instagram and Facebook or connect on the Apple News Format - Authentic Living Digest. Until the next time!